Note, the fabrics for this project were given to me by Island Batik as part of their ambassador program. 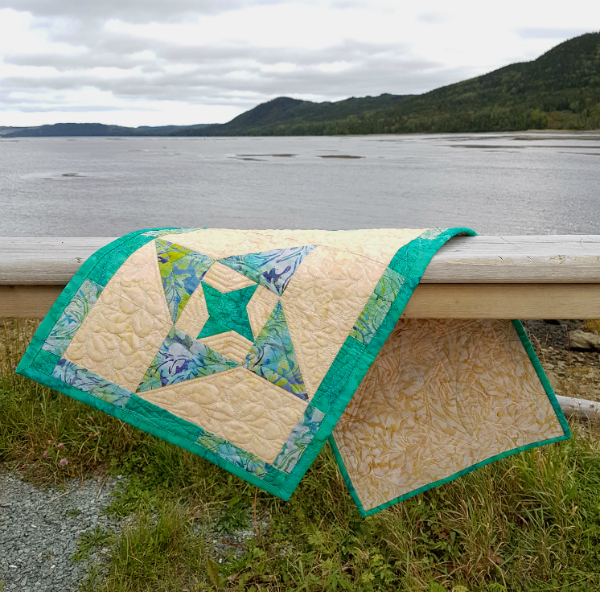 It's time to share my September Island Batik challenge project and it's definitely a favourite of mine 😊 It all started with the challenge theme - "Star Struck." Oh, there are so many possibilities with that theme, aren't there? 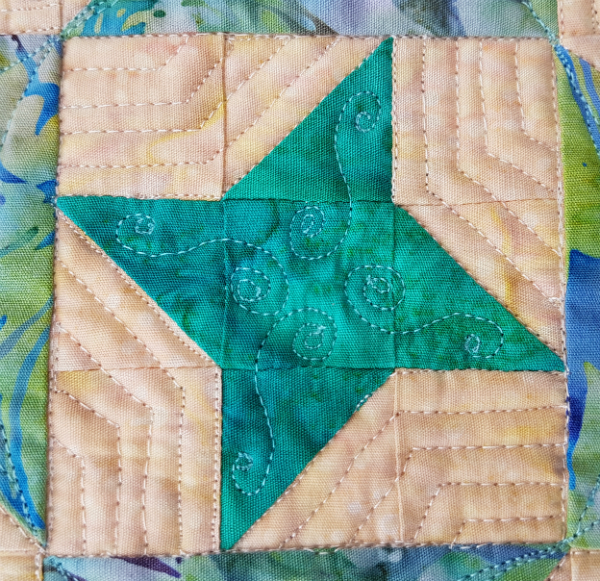 I've always loved star blocks of all sorts, so coming up with a quilt to make that included stars would not be difficult. I decided to make the skinny mini size from my Friendship Galaxy pattern. Of all my patterns, this is the one I've used most. I've made two of the baby quilt size (here and here) and another of the skinny mini quilts. Here's my Island Batik version. 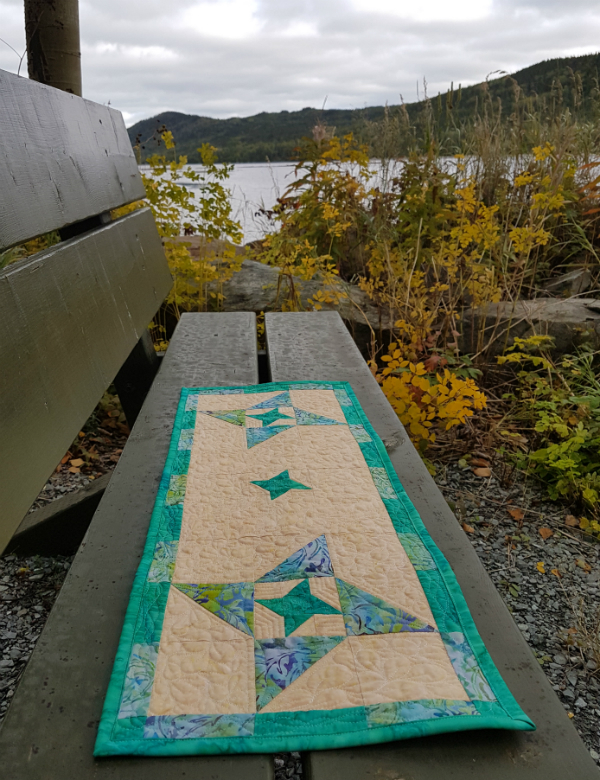 I enjoyed taking this mini quilt for a walk on the trail this afternoon and seeing the beautiful fall colours that are just starting to appear. This time around I chose to use only one fabric for the background, a beautiful mottled cream. 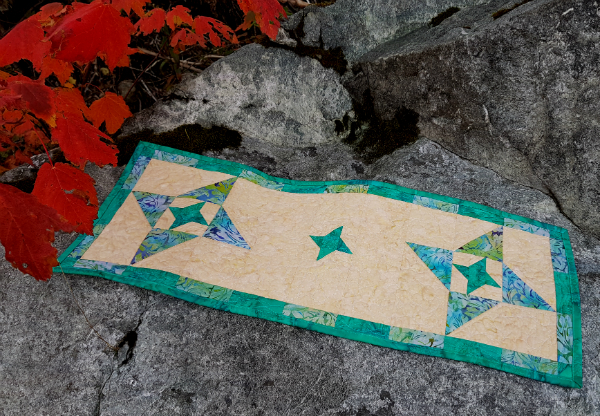 For the stars, I used a deep marbled teal for the smallest friendship stars and a leafy print for the larger stars. 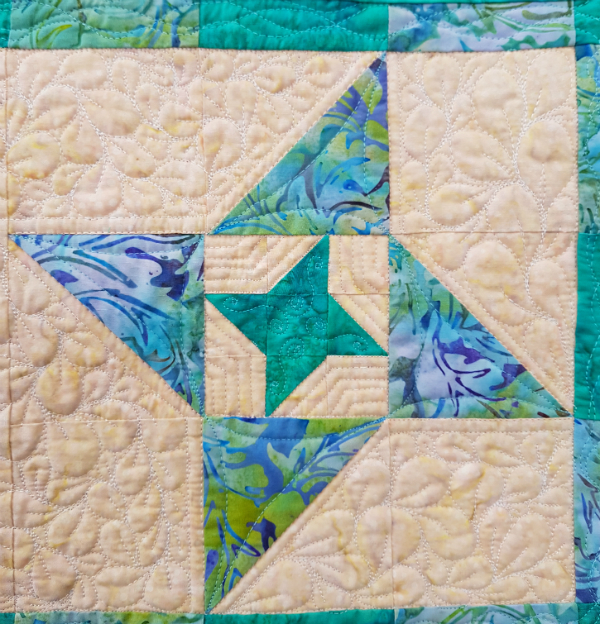 The shapes in the leafy print inspired this leafy quilting design, done in Aurifil 2311. It was very meditative filling all the negative space with different sized leaves, facing all directions. Usually when I'm quilting the negative space with one design, I try to fill tiny areas of negative space with the same design, but sometimes it's hard to make it work on such a small scale. 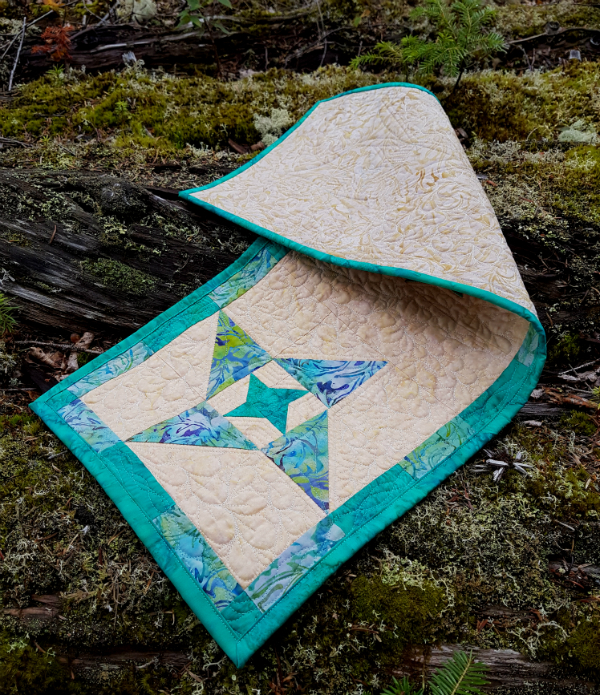 So, in the spaces around the small stars, I decided to just echo around the stars, which filled the space nicely and was much simpler to quilt, too. Win, win! The small stars got some quick elongated swirls, which I love. Aurifil 5006 is a fair bit lighter than the teal batik, but it was the best match I had on hand. Plus, I like the contrast. 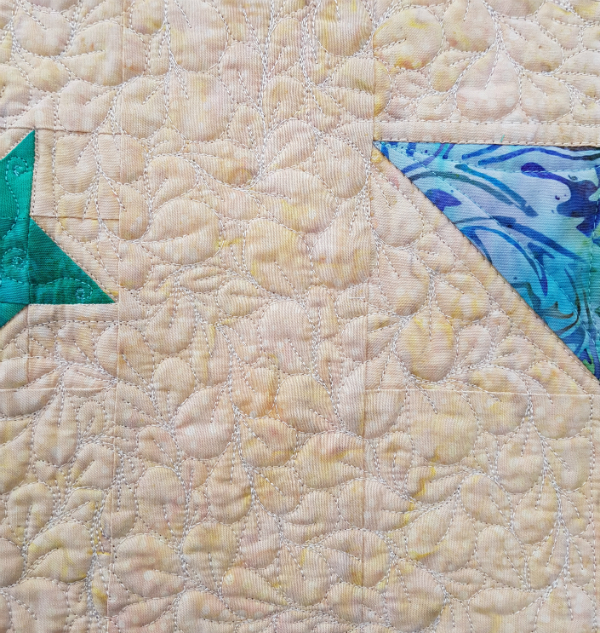 The larger stars got this quick point-to-point design, which is one of my go-to designs for triangles (and sometimes squares). 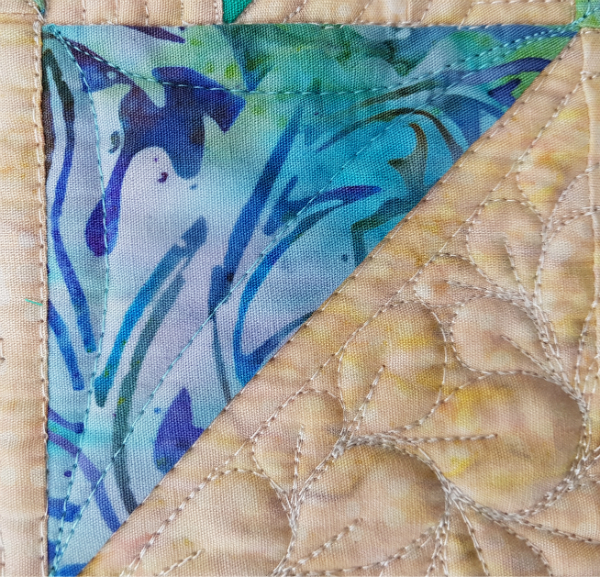 Once all of that quilting was done, I realized I didn't have enough thread left for the alternating back and forth lines I had been planning in the border rectangles. Turns out, I did those back and forth lines on the first skinny mini quilt, too. I decided to try some organic wavy lines instead, letting them cross willy-nilly. 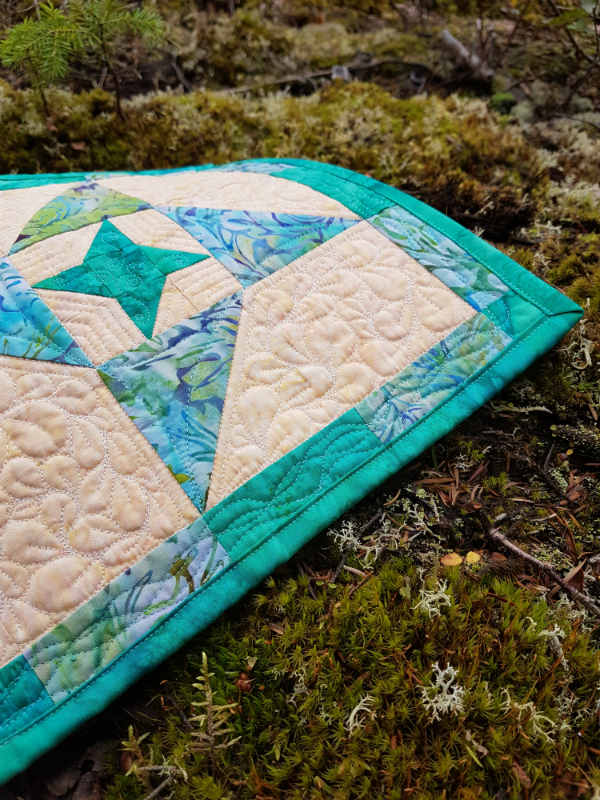 I quilted three wavy, criss-crossing, lines and then put on the binding, but it didn't look like quite enough quilting in the border, so I went back and added one more wavy line. I didn't have enough of the 5006 to wind another bobbin, though, so I used 2311 in the bobbin for the last line. Truth be told, I'm not 100% happy with the wavy lines. They're more messy looking than I really wanted them to be, which I guess comes from their organic nature. Maybe if there were more of them, in a larger space, I'd be happier with them, so I'll have to give them another try sometime where I have room for more lines. 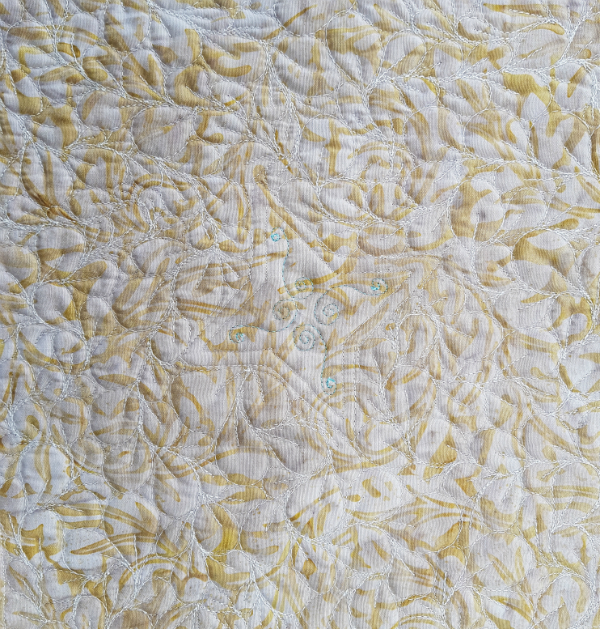 As always, I love how the quilting looks on the back, where I used another pretty cream batik. If you want to make your own skinny mini Friendship Galaxy quilt (or one of the other three sizes), you can get your copy of the pattern in my Payhip or Etsy shops. That is a really lovely quilt! It would look good in my kitchen/dining room.... I'll have to see if I can work one of these in on one of my batik projects. Love your runner! The colors and, of course, the Island Batiks are great! Nice setting for the photos too!